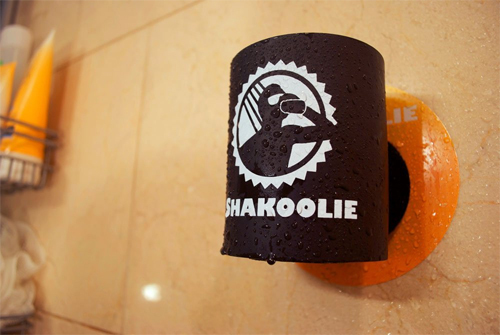 Say that five times fast: “The Shakoozie Shakoolie Original Shower Beer Koozie .” Or better yet, sing it. In the shower. With a beer. The product is the Shakoolie, the company is Shakoozie, LLC and you should accept no substitutes! Proof that there are solutions to all of mankind’s greatest issues, the Shakoolie is exactly what it sounds like it is: a shower koozie. And here you thought Velcro was just for shoes. Want a Better Shower Beer? One night, we asked ourselves “what if you could just stick your beer to that shower wall?” It was glorious friends – one of those “aha” moments. We combined a simple foam koozie with industrial grade velcro to create shower beer awesomeness. Not only is your beer now hands free, it also stays ice cold in a steamy shower. Now, you’re probably thinking to yourself – “is it really that good?” Of course! The shower beer is the most relaxing thing on the planet. It’s great before going out. It’s great after work. Plus with Shakoolie, that hands free experience allows you to relax and enjoy your shower. We all love a good beer in the shower, and we’re just two guys who set out to make that experience better. So go ahead and pick up a Shakoolie today!